The Peek Classic is a simple inexpensive email (and texting) hand held. 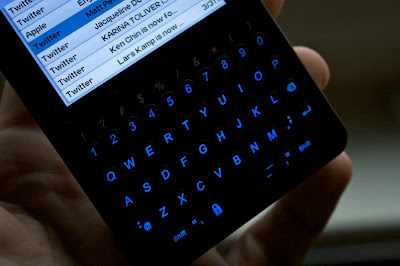 Think of it as what the original Blackberry's were like but only thinner, lighter, and cheaper. My first reaction was, "What's the market for such a niche product?" Now here I sit, a Peek owner and fan. What it does, it does very well. I check my email at a glance and feel more connected on the the go or at the client site then I even imagined. Sure, a smart phone would give me the same experience and more but until the cost and commitments are lower. I'm sticking to a prepaid phone and my little Peek. I use a $30/month prepaid for all my calling and pay $16/month for Peek email. That's more than I'd like and I've seen a $10/month deal I missed but it's cheap considering how often I use the Peek.